Western Michigan University students marched in protest against the removal of trees on their campus. More than 60 WMU students gathered to protest the university’s removal of 58 trees in order to put a new residence hall and student center in their place, as reported by MLive. According to a poster for the event, the “Save the Trees Student Initiative” was hosted by the Students for a Sustainable Earth and the Western Michigan Biology Club. 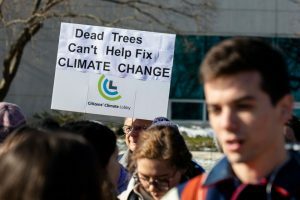 Many students held signs, which included slogans like “cut a tree, cut a life,” “teach peace,” and “we speak for the trees,” while chanting “save a tree, save a life,” as shown in a video posted on Mlive’s YouTube channel. “Join us for a march to denounce the plans to cut down 50+ trees near the Ernest Burnham Building on WMU’s campus,” the event’s Facebook page read. The student group also shared a Change.org petition, started by Abbie Bristol, a WMU student in the group, opposing the university’s actions on its Facebook page. “We believe in the intrinsic value of these trees as beautiful, living components of the campus landscape, and the ecosystem services these trees offer: carbon sequestration, stormwater management, and islands of habitat for wildlife on campus,” the description says. The petition also requests a public polling for the design plan of the new buildings and wants the polling to include a new plan that would work around the trees.